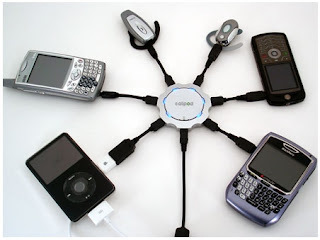 Callpod, Inc. has reduced the starting price of the Chargepod, the product that simultaneously charges: iPod, iPhone, Zune, Treo, BlackBerry, Sony PSP,Nintendo DS, Most Cell Phones, PDA & Portable Gaming Devices. Now, the Chargepod a 6-in-1 device is available at $39.95 and the bundle pack at $79.95. 1. The Chargepod carries a street price of $39.95 which includes the Chargepod base unit, a carrying case and wall plug (100-240V AC, 50-60 Hz). Each additional adapter, like say, for the iPhone, is $9.95. 2. 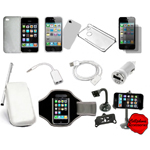 Callpod offers a bundle pack for $79.95, which includes the Chargepod base unit, AC wall plug, car charger, carrying case and the following six popular adapters: Apple iPod/Phone, Motorola, Blackberry, Nokia, Palm Treo and Sony PSP devices. The Chargepod, allows users to charge most mobile electronic devices with a single power cord from almost anywhere including at home, in the car or at the office. Callpod, is an emerging technology company that has created and patented unique audio conferencing and content sharing technologies for wireless consumer electronic devices and cellular telephones. It is a strategic solution provider as well as reference and ASIC designer for manufacturers of cellular, consumer electronics and wireless devices.